B-25J. This was the aircraft used by Lt. Col. Jimmy Doolittle and his raiders to bomb Tokyo during WWII. The North American B-25 Mitchell is an American twin-engine, medium bomber manufactured by North American Aviation (NAA). It was named in honor of Major General William “Billy” Mitchell, a pioneer of U.S. military aviation. 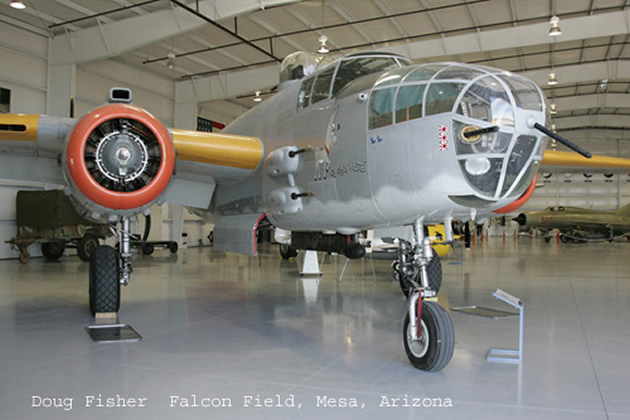 Used by many Allied air forces, the B-25 served in every theater of World War II and after the war ended many remained in service, operating across four decades. Produced in numerous variants, nearly 10,000 Mitchells rolled from NAA factories. These included a few limited models, such as the United States Marine Corps‘ PBJ-1 patrol bomber and the United States Army Air Forces‘ F-10 reconnaissance aircraft and AT-24 trainers.